Construction of a secret command center for the Red Army – built for the Supreme Commander-in-Chief, I.V. 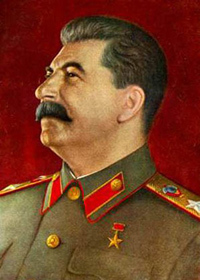 Stalin - began in the 1930s. It was part of a state program to provide defensive capability for the country. As the world was on the brink of the Second World War, dual-purpose facilities were being constructed: a metro station functioned as an air-raid shelter; a tractor plant produced tanks; a macaroni factory was capable of producing gunpowder. The bunker construction was highly secret; it was disguised with a huge sport complex built at ground level - legend has it that Hitler ordered the Luftwaffe never to bomb stadiums. But the sport complex construction was stopped in 1938 as soon as the bunker had been finished. Stalin's Bunker became part of a secret system known as "Metro-2" and was connected to the Kremlin with a 17km underground road – the amount of underground tunnels exceeded actual metro lines by the beginning of the Second World War. By 1941 the bunker was well protected against bombing raids with reinforced concrete floors and walls of 6-8 meters thick. The location for the bunker was deliberately chosen in the eastern part of Moscow, as the enemy was approaching the capital from the west. If Hitler ever entered Moscow, Stalin would have time to escape as there were three military airports situated not far from the bunker. Nevertheless, Stalin preferred to work in the Kremlin and used the shelter only once, in December of 1941. It was here that Stalin, Zhukov and other important military commanders met to decide whether Russians should leave Moscow or stay and defend it. The interior has survived to this day without changes. 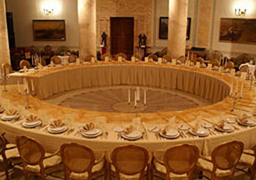 The bunker contains the Session Hall, Stalin's work office, some general rooms and a dining room decorated in the Georgian style. Visitors to the Secret Command Center can see these premises, experience the unusual acoustic effects of the Session Hall, and see some personal belongings of Josef Stalin. We are happy to offer you a tour of Stalin's Bunker, which can be a part of your Moscow tour program.